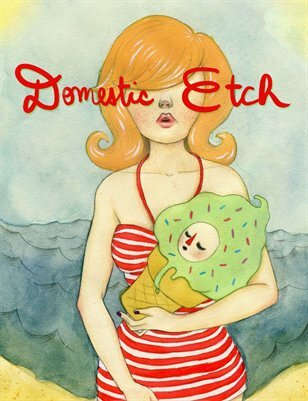 This issue of NY and Providence based art/design magazine "Domestic Etch" features interviews with Julian Callos, Australian illustrator Mel Stringer, installation and sculpture artist Patrick Jacobs, Stacey Rozich, Benjamin Constantine, artist couple Dimitri “Jangojim” Sakelaropolus and Anneke Caramin, and painter Sophie Bastien, as well as new work from Katie Turner, Andrew Kolb, Devon “Deerface” Smith, Jane Mai, Steph Pena, Sashiko Yuen, Samantha Leriche-Gionet, Mark Silipo (Magic Sweater), and many more. Also inside are multiple comics by Jane Mai and Benjamin Constantine (Plump Oyster). 86 pages of pure arty love!